In the chorus of saints there are saints who have the gift to cure illnesses, namely physical illnesses, and the people run to them. Parishes and Monasteries that have such a reputation are flooded with people. Of course, no one will criticize this, since it is natural for a sick person to run to a hospital and it is gratifying that people are resorting to the Church, which is an Infirmary for souls and bodies. I wanted to stress a few points related to this issue, but also about the spiritual life in general. First: Indeed there are saints who have the gift of healing physical illnesses. And today, as in olden times, miracles take place, since Christ is always the same and works wonders through His saints. "Wondrous is God in His Saints." Second: Physical healing is not the greatest gift nor the greatest miracle, nor is it the primary issue of life. The saints do not seek out miracles in their lives, but they try to live "in repentance". The purpose of our lives is theosis, which is communion with God, and is obtained by repentance and the application of God's commandments. Third: The greater, more "superior" gifts are love, repentance and theology. Theology in the life and teaching of the Orthodox Church is identified with the vision of God. A theologian is one who has seen God, can speak about Him, and knows how to truly pray. "If you are a theologian you know how to truly pray, and if you know how to truly pray you are a theologian" (Saint Nilus the Ascetic). A theologian is one who has discernment, and who is in a position to discern between the created and the uncreated, the divine and the demonic, and can heal the soul. Besides, spiritual health, which is what matters, is directly related to physical health, since many physical illnesses have their source in abnormalities of the soul. For example, if you don't like someone and your stomach hurts (most of the time, after all, it hurts not because of what we ate, but of who is eating us), or you have thoughts and suspicions against someone and you suffer from headaches. Orthodox theology has nothing to do with rational processes and contemplations, but it is related, first and foremost, with the heart, the spiritual heart, which is the space in which God reveals Himself. True theologians are those who experience God and have defeated and exceeded the limits of death in their personal lives. One such Saint, Theologian and Father of our Church was Saint Hierotheos, the Bishop of Athens, disciple of the Apostle Paul and teacher of Saint Dionysios the Areopagite. He is, as is stressed in his Apolytikion, a student of exact theology, that is, a great theologian and interpreter of theology, as well as a great hymnographer, since at the Dormition of the Theotokos he was present and singing hymns to the Panagia. 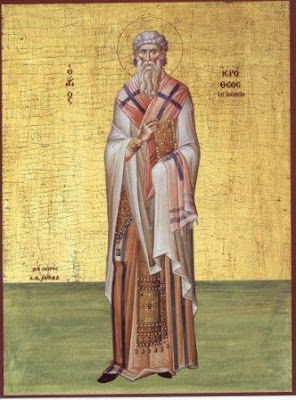 "He was a conductor after the Apostles of the divine hymnists...all who saw and heard him, and had previously known him or did not know him, considered him divinely inspired and a divine hymnographer" (Saint Nikodemos the Hagiorite). A true disciple of the Apostle to the Nations, he suffered and learned divine things. Having renounced the idols, he experienced repentance and true love and achieved the vision of God, which is identified with theology, and it is why his words were vibrant and relevant, truly mystagogical. "A true student of theology, you were a mystagogue, Father, of higher things." That which the world has need of today, having become tired of empty words, are not contemplations and ossified reasonings of the brain, but living theological words, which offer true supplication, because it does not cause but it supplicates, it comforts the heart. This is because they are not empty words, but new words that recreate, regenerate and enliven. It offers a meaning to life, a love for true life, and not simply for our biological existence, for life is one thing and biological existence is another, life is one thing and true life and citizenship is another, that is, a life "in God". The Apostle Paul encourages us to seek to acquire the "superior" gifts, which are love, repentance and theology. The student of exact theology, Saint Hierotheos, was a mystagogue and initate of these superior things. The continuous preoccupation only with minor things, perhaps does it reveal our spiritual poverty and shallowness? Source: Ekklesiastiki Paremvasi, "Ο ΥΠΟΦΗΤΗΣ ΤΗΣ ΑΚΡΙΒΟΥΣ ΘΕΟΛΟΓΙΑΣ: ΑΓΙΟΣ ΙΕΡΟΘΕΟΣ", October 1997. Translated by John Sanidopoulos.